Woody Harrelson's play Bullet for Adolf, which had its debut in Toronto last year, made its off-Broadway debut Thursday to mixed reception. Woody Harrelson’s play Bullet for Adolf, which debuted in Toronto last year, made its off-Broadway debut Thursday to mixed reception. The play takes Canadian actors David Coomber and Brandon Coffey to New York in a story written and directed by Harrelson, star of Cheers and The Hunger Games. Bullet for Adolf tells a story from Harrelson’s own life and was written with his friend Frankie Hyman. The two met on a Houston construction crew in 1983, where Harrelson was trying to make money to launch his acting career and Hyman was making a few dollars and trying to kick his drug habit. The play features the laconic slacker Zach, his black crewmate Frankie and friend Clint, who get involved in a story about someone trying to steal the gun that may have been used in an attempt to assassinate Hitler. EW’s Keith Staskiewicz said the play has "quite a bit in common with a pot-addled jaw session: You'll laugh way more than you were expecting, everything meanders rather pleasantly, but by the end you won't really remember much of it at all." But Staskiewicz nonetheless found it hilarious, saying Bullet for Adolf is "filled with go-for-broke comedy that works far more often than it doesn't." "It's a messy kind of funny, the kind that isn't afraid to offend and isn't ashamed to be dumb, and it always aims for the belly laugh over the polite chuckle," he adds. 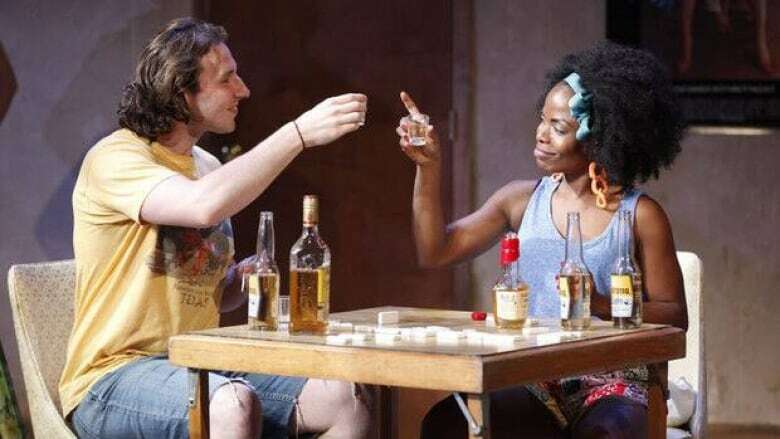 The New York Times Ben Brantley took exception with the high decibel level of the play, and said it appears to be a string of one-liners and oft-told anecdotes from Harrelson’s repertoire, comparing the play to an episode of Cheers. Zach, who stands in for Harrelson, "is less a fully conceived character than a shorthand version, held together by a tone of voice and a few signpost eccentricities." Brantley said. But AP writer Jennifer Ferrar had praise for the performances, saying Alberta-raised Coffey is "imbued with casual charm" as Zach. "David Coomber is particularly effective as the third roommate, Clint, a delicate, artistic friend of Zach’s who’s headed to Juilliard acting school in the fall. Coomber milks his character’s diva side for all it’s worth, and his well-timed slapstick reactions and clever rejoinders provide many memorable laughs and visuals," Ferrar wrote. She called the play "lewd, rude and often screamingly funny." Bullet for Adolf played at Hart House in Toronto in 2011 and is playing at New World Stages in New York.